The optical layout of this design is shown in the figure. Light from the object is reflected from the primary concave mirror in a convergent beam which is deflected side ways by a small flat secondary mirror to form image outside the main tube. This image is magnified by the eyepiece. It is the number of times an object is seen enlarged diametrically. For example,two stars which subtend an angle of 0.5 degrees with the unaided eye will be seen 50 degrees apart through a telescope at 100X magnification power,(or simply power). 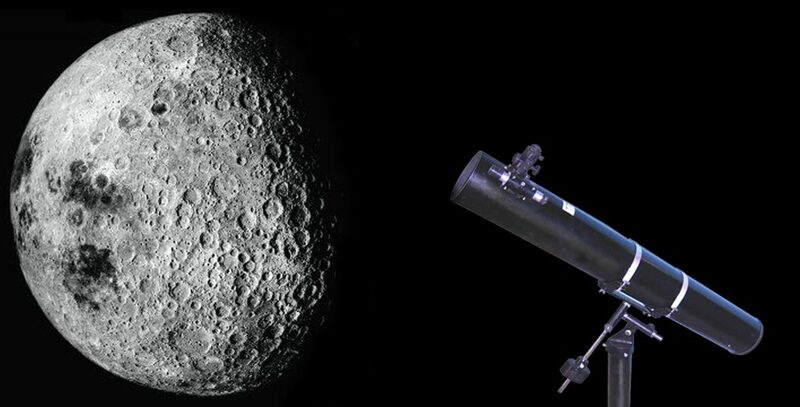 Photographs alongside show a chimney as seen with the naked eye (left) and as seen through our Sky Probe model telescope at 42X power. About 35X power is sufficient to see Moon’s craters, Saturn’s rings, Jupiter’s 4 Galilean satellites, phases of Venus or Mars as a reddish-yellow disc. Most deep-sky objects can also be seen at this magnification but a large aperture telescope is needed to see them with reasonable brightness. It is the minimum angular separation between two point objects seen distinctly as two. The Resolving Power of a normal unaided eye is about 4 are minutes (or 240 seconds) Thus a telescope of 1 arc-second resolving power is 240 times more sensitive than the naked eye and can be used at 240X power without distorting the image. Figure shows two stars fully resolved in the left diagram but not resolved at the same magnification in the right diagram. It is the departure of the mirror surface from the ideal surface measured in terms of wavelength of green light. A mirror polished to a 1/8 wave accuracy or better will perform to the theoretical limit of resolution and is said to be diffraction limited. It is so called because further improvement in resolution is restricted by the wave nature of light rather than the surface accuracy. The propagation of light in waves causes the image of a star to be a disc (called the diffraction disc) rather than a point. Larger the mirror, smaller the disc and hence better the resolution and higher the useful magnification (at which the image is undistorted). Also a telescope with poor optical quality will form larger and deformed diffraction discs than that of the same size with diffraction limited optics. The former will give a distorted image at higher magnifications while the latter will retain sharpness to the theoretical limit. In general, a magnification of 25X per centimeter of aperture is the maximum accepted limit for diffraction limited optics. It is clear that any telescope can have this maximum magnification or even more but the key to its performance is the ability to retain sharpness of the image at this high magnification. The brightness of stars is measured in terms of magnitudes. The first magnitude stars are brighter than the second by two and a half times. The second magnitude stars are 2½ times brighter than the third and so on. Under good seeing conditions the naked eye can see up to 5th magnitude stars. The big eye of a 150 mm telescope will show up to 13th magnitude stars. Most of the Messier objects lie within this 5-12th magnitude range. The light gathering power of a telescope, which is directly proportional to its aperture (or mirror size), is expressed in terms of the magnitude of the faintest star than can be seen with it. This type of mount allows the movement of the telescope tube in two axes, one being horizontal (or altitude), the other vertical (or azimuth). Thus the telescope can be pointed in any direction. Here one movement is along the polar axis of the Earth and the other perpendicular to it, the advantage being that sky objects can be tracked by moving the telescope along one axis only. This type of mount consists of a box like structure made mainly of wooden boards on which the telescope tube assembly can be placed. This allows the movement of the tube in a horizontal plane (360 degrees) and a vertical plane (0 to 90 degrees) thus allowing the tube to be pointed in any direction in the sky. We have our own aluminising facility. All our mirrors are aluminised in our own vacuum coating plant. These highly reflective, hard coated mirrors will retain their brightness for a number of years if cared for properly. However should your mirrors require re-coating, send them back to us. We will re-aluminise your old mirrors to make them as good as new and your telescope will once again show images as bright as ever. If you have any other front surface aluminising job, do let us know.